iPhone and iPod touch software, games, toys, calculators and web applications by Kudit: Not just for iPhones anymore! Today, Kudit announces a new look and feel for the desktop version of Kudit! The purchase process has been refined to be easier if you're not on your device. Based on the Twighlight Zone episode "Nick of Time" with William Shatner, this advice-giving device is not for the faint of heart. 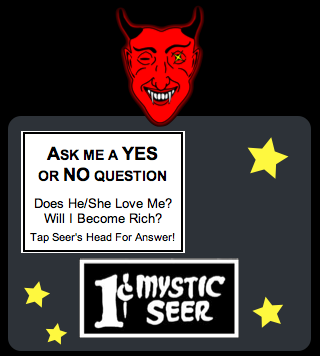 It all begins with a simple Yes or No question, but the Mystic Seer knows all and will keep you spellbinded as he carefully tells you your future. But don't get too addicted! You may find the answers to your questions upsetting.